Now CLIA Waived! K Number in CLIA Database is K010582. Strep A infections originate from group A streptococcal bacterium that can initiate a variety of health problems. Strep A can manifest itself as a mild skin infection or sore throat to severe, life-threatening conditions such as toxic shock syndrome and necrotizing fasciitis, commonly known as flesh eating disease. Nearly everyone is familiar with strep throat, which is the most common form of the disease. Health experts estimate that more than 10 million mild infections (throat and skin) like these occur every year. Group A streptococcus is one of the most significant human pathogens causing acute pharyngitis, tonsillitis, impetigo, and scarlet fever. It is very important to differentiate streptococcal infection from other etiologic agents (e.g., viral, mycoplasma, or chlamydial) so that appropriate therapy may be initiated classical methods for identification requires 8-48 hour�s culture time for throat swab specimens or other exudates to produce results showing bacitracin susceptible beta-hemolytic streptococci. Rapid diagnosis and timely treatment of group A streptococcal pharyngitis infections will reduce the severity of symptoms and further complications such as rheumatic fever and glomerulonephritis. Squeeze out as much liquid as possible from the swab by pressing the swab firmly against the side of the tube with two fingers. A distinct colored line in the Control line (C) area should always appear. The test is invalid if no Control line forms in 5 minutes. 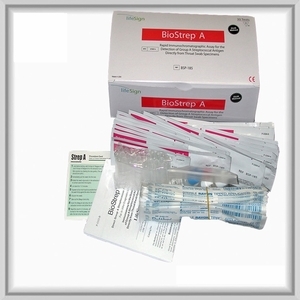 When the test shows an invalid result, the test should be considered invalid and should be repeated with a new test strip and a new swab sample.